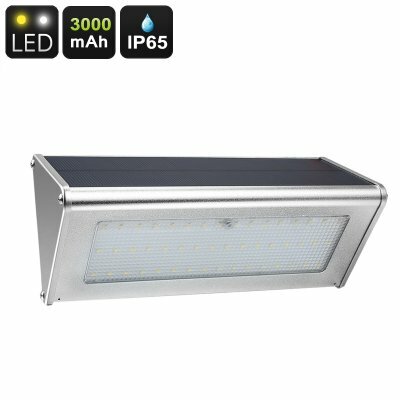 Successfully Added Outdoor LED Solar Light - 48 LED Lights, 800 Lumen, Solar Panel, 3000mAh, 4 Lighting Modes, IP65 Waterproof, 6W to your Shopping Cart. Light up your pathway for visitors with this outdoor LED solar light. Featuring a motion detection sensor, this outdoor LED light will automatically turn on whenever movement is detected. Thanks to this, your visitors will always be treated to a lit up pathway towards your front door. It features four different lighting modes. Whether you wish to light up your path during the whole night or simply when movement is detected – this LED light is sure to meet your demands. Its 48 LED lights together produce up to 800 lumens of bright white light. This is enough to light up your entire drive way. With its durable aluminum alloy design and IP65 waterproof body, this solar light can be used efficiently in any weather condition. Therefore, you’ll be able to leave it out throughout the year without needing to worry. It furthermore features a solar panel that will automatically recharge its powerful 3000mAh battery during the day. This guarantees that your LED light will always have enough juice to light up your pathway through the longest of nights. Thanks to its solar panel and motion detection, this outdoor LED provides you with an environmentally friendly and cost efficient way to light up your garden. This LED Light comes with a 12 months warranty, brought to you by the leader in electronic devices as well as wholesale outdoor lights..